We spend so much of our lives degrading ourselves. Want to know the difference between positive successful people and depressed people who want to attain their dreams? Okay, yes, there are several answers to that, aren’t there? But one of those is they forgive themselves. They don’t keep residual anger or guilt. They forgive themselves for things they’ve done and move on. No guilt. No worry. No doubt. Now if that isn’t a way to live, I don’t know what is. So forgive yourself. If you’ve done something that makes you feel bad, ask the universe to forgive you, make peace with it, and move on. Yes, you knew I was going to get to this sooner or later. Gratitude is an amazing thing. When you truly feel grateful for something, it sounds out the most amazing vibration into the universe, connecting you to your dreams and to more amazing things than you can imagine. Now, notice I said ‘truly feel grateful”. No false gratitude here. I put this as an extra, because this is a daily assignment. 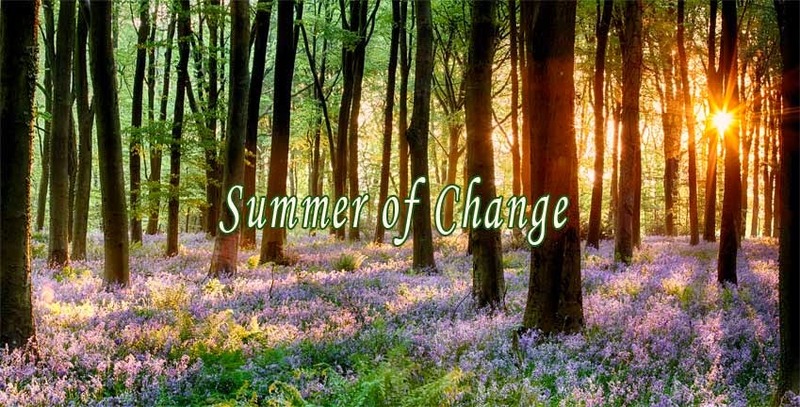 At least through the rest of the Summer of Change. Hopefully throughout the rest of your life in one way or another. Now, I want you to do this by hand if you can. Writing by hand is actually a much deeper connection than typing something. You have to draw each letter, not just hit a button. Stop planning, stop hoping, stop regretting, stop dreaming for just a second. Today, I want you to live. Ignore yesterday. Tomorrow will take care of itself. For today, do something just for you. Go to the movies, buy a book you’ve been wanting to get, walk in the park with an ice cream cone and a smile. Learn a magic trick. Live your life today. Don’t just hope it will happen. Live it. Some of you might be saying, ‘but what I’m working for hasn’t come through yet’. My answer? Get into that feeling. Remember how it will feel when it arrives? Have that in your head? Now go do something today that drives that feeling home. Your dream is to be a size 6? Do NOT go to the mall and look at the size sixes as invariably you will then compare them to your current size and that’s just depressing. Instead, be a size 6 in your mind. Feel how amazing you look. Walk around town as a size six. You feel it. You exude it. Wow, you are so tuned into it. Yep. Today is the day to love yourself. You. You amazing, wonderful person. Hug yourself. Now. What? Somebody is watching? Make a beeline for the bathroom, lock the stall door and hug yourself. Pour every ounce of love you can imagine into yourself. For YOU are important. Very important. Know it. Feel it. Hug it into you. If it feels odd and makes you want to run from the room, hug yourself harder! Because you haven’t been loving yourself enough. You deserve to be loved, so love yourself. Do it. Laugh. Don’t have anything to laugh about? Buy a Victor Borge video. Get a copy of one of the Carol Burnett Show videos. Go and watch children play in the park. Watch the original Muppet Movie. Find something funny and lose yourself in it. Laughter lifts the spirit, helps our body to return to its natural healthy state, and just makes us feel better. Just make sure it is positive laughter and not negative laughter. Laughing at someone’s misfortune will not bring about the same results as positive laughter. Put away your books, your work, your partner, your children, your boss, your parents, and every issue affecting you here on earth and open up to the divine within. Pray, meditate, channel, however you choose to commune with the universe is your personal choice. For me, meditation and channeling are my current ways to do so. Take 30 minutes. Lock the bedroom or bathroom door. And let the word wash away as you get in touch with the divine within you. Talk about a sustaining, positive force. Florence Scovel Shinn has an interesting take on the phrase ‘Cast your burden’. If you have done any study of the bible, you have heard this phrase. “Cast your burden on the lord so that it may be light”. What does that mean? Well, it essentially means we are not meant to do this on our own. We are such independent creatures sometimes, or we’ve been taught not to ask, that we don’t even think that our burdens are not ours to bear. Nope. Not one. So cast your burden upon those who are ready and willing to bear it, to help take the weight off your shoulders, to make things right. Your job? Be happy. I’m not much of a nature person – I usually prefer to spend my time communing with what is in the spiritual realm than the physical – but I do understand the beauty of it and how it affects us. Grounding ourselves by being outside, away from man-made life, can be one of the most important things we do. So leave the house. Go for a walk in the nearby woods, jog through the park, sit in your garden and raise your face to the morning sun. Stress is a killer. It kills bodies, dreams, thought… Everyone has a way to de-stress their mind and body. I suggest you take thirty minutes a day to do so. ExerciseTake a walk in natureFind people to laugh with (notice I said with, not about – no gossipy talk here or making fun of others)MeditateDrawDo what helps you to de-stress and do it daily.